The original Half-Minute Hero is quite possibly my favorite game released for the PlayStation Portable. Its inventive take on role-playing games was refreshing, while its self-referential humor regarding the conventions of that genre charmed the hell out of me. The news that the game would be finding a new home on Xbox Live Arcade was wonderful to hear, and I looked forward to revisiting the high-pressure adventure. Sadly, despite new content and the addition of a hand-drawn art style, this release also omits nearly all of the variety found in the PSP version. Nevertheless, Half-Minute Hero Super Mega Neo Climax is still a good deal of fun. 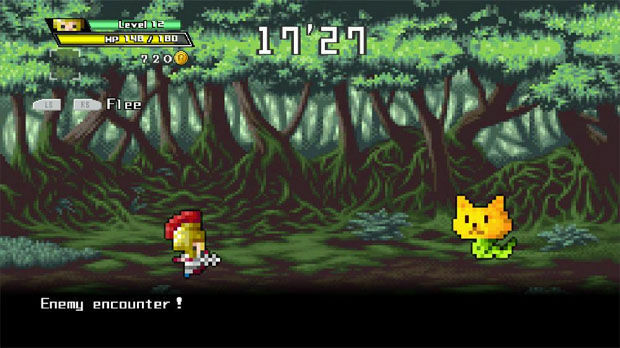 Half-Minute Hero's gameplay is best summarized as a compression of the elements found in classic, 8-bit role-playing games. With only thirty seconds to save the world from destruction at the hands of a Dark Lord, the Hero (appropriately named, "Hero") must fight monsters, earn levels, buy equipment and even help villagers with sidequests. All of this is made possible with help from the Time Goddess, to whom Hero can pray (and make a donation of cash) in order to rewind time and reset the clock. Each rewind is more expensive than the last, putting a ceiling on how long you can actually spend on any given stage as you will eventually be unable to earn enough cash in 30 seconds to pay a high rewind price. Additionally, the game scores you based on how quickly you can finish each stage, both on time and your experience level, making it a worthy goal to save the world quickly. The core of the game, "Hero 30" mode, consists of over 30 of these quests, which can take anywhere from one to five minutes. Some of these feature multiple solutions which create branching paths and most have special awards that may require several attempts to earn giving the title considerable replay value. Features new to the game include a hand-drawn art style which is, for lack of a better word, hideous. It looks like paper dolls on a storybook drawn by an eight year-old. The original sprite-based graphics are still available but, if you don't want to see the new graphics, you'll have to change back every time as the game doesn't save the setting. An online multiplayer mode has also been added to the mix, allowing up to four players to compete to be the hero who ultimately defeats the Dark Lord in ten different quests. Players race to collect unique pieces of equipment to give them an edge over the competition while keeping the clock ticking by making donations to the Time Goddess. Or, if you want a more relaxed game, you can turn off the countdown timer entirely. The multiplayer works from a technical perspective and it's admittedly fun to run in to an opponent's fight right as they're killing the guardian of a treasure, then steal their reward right out from under them. But the multiplayer experience isn't any deeper than occasionally inconveniencing a player with theft and bantering about who's going to pay the Time Goddess when the limit is almost up. You can't fight each other, after all, since you're all going towards the same goal, so there isn't much in the way of actual interaction with other players. You might as well be playing alone. It's also worth noting that Half-Minute Hero: Super Mega Neo Climax contains considerably less variety of content than its PSP predecessor. The original release contained modes like "Princess 30" and "Dark Lord 30" which applied the 30 second time limit to a variety of other gameplay styles such as shoot-em-ups and tower defense. Unlocking these modes in Super Mega Neo Climax reveals that they are simply new, generally lengthier quests in the mold of Hero 30 featuring a different lead character. The absence of these modes is a huge disappointment if you were looking forward to the breadth and scope of the PSP game on Xbox Live Arcade because it's simply not there. While it's possible that such modes may be released piecemeal as downloadable content in the future, the game as it stands now fails to live up to precedent. 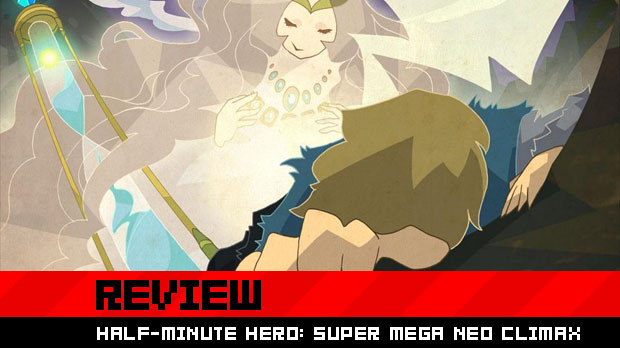 Which isn't to say that Half-Minute Hero: Super Mega Neo Climax is a poor game. Far from it. It's still an inventive and fun experience that Xbox 360 users are sure to enjoy. 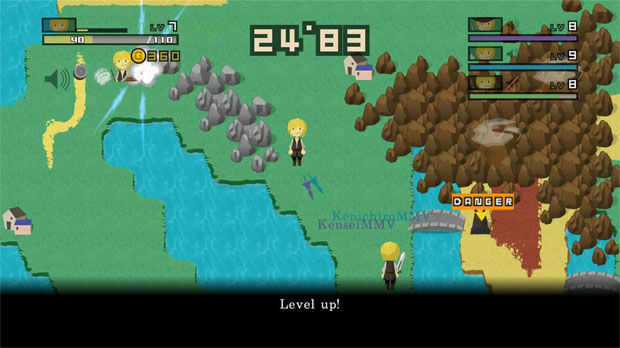 But if you happen to also own a PSP, you would be far better served seeking out the original Half-Minute Hero instead.